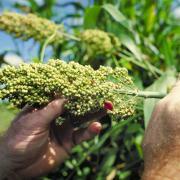 Sweet sorghum can be used the the production of biofuels in two ways. The stalk and seed are used directly for biomass energy and their high sugar content allows them to be fermented to make ethanol. Sweet sorghum. Photo: Dennis Pennington, Bioenergy Educator, Michigan State University. Sweet sorghum was first introduced into the United States in 1852. Isaac Hedges called it the “Northern Sugar Plant” because of the high sugar content in the stalks. Sweet sorghum is the same species (Sorghum bicolor L. Moench) as grain sorghum. Although sweet sorghum is primarily grown to produce sorghum syrup, it can also be used as a feedstock for biofuel. In favorable environments, sweet sorghum varieties can grow 14 feet tall and produce 20 to 50 tons of biomass (fresh weight) per acre. It is more drought tolerant than corn and requires less nitrogen fertilizer. Dr. Morris Bitzer calculated that corn has an energy efficiency of 1:1.8, while sweet sorghum has an efficiency of 1:8 (personal communication, 2009). An international group called the Sweet Sorghum Ethanol Association was organized in 2007 to promote sweet sorghum crop management practices and technologies to make ethanol and bio-derivatives. 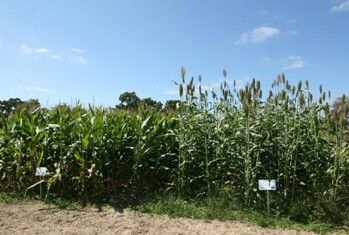 Corn (left) and sweet sorghum (right) at the Kellogg Biological Station in Hickory Corners, Michigan. Photo: Dennis Pennington, Bioenergy Educator, Michigan State University. for heat in buildings or to produce electricity. The vinasse, which is a mixture of dead yeast and plant material after fermentation, can be composted and sold for fertilizer. The statement “all biomass is local” also applies to sweet sorghum feedstock. Ideally, each sweet sorghum farm would have its own processing facility. For gasification to be economically feasible, small-scale pyrolysis systems are needed. A study by Memphis Bioworks showed that sweet sorghum processing plants should be located no more than six miles from production fields in the Delta region (Tripp et al., 2009). To utilize the bagasse for feeding, cattle should be in the vicinity. Sweet sorghum can be grown in most of the continental United States. However, sorghum is less cold tolerant than corn. Soil temperatures should be above 65°F at planting to achieve good seed emergence. Fungicide seed treatments can be used to reduce seedling disease infestation. Fortunately, sorghum plants can often compensate for low plant stands by producing several tillers per plant. Optimum planting rates vary by region and soils. Generally, target plant population should be 60,000 to 100,000 plants per acre. Fields with irrigation should have higher populations than non-irrigated fields. Plant lodging is more likely to occur in high population fields because stalks become smaller in diameter due to competition. Height is also an issue; sweet sorghum can be blown down in strong winds. Most sweet sorghum varieties planted in the United States today were developed at the U.S. Sugar Crops Field Station at Meridian, Mississippi. Unfortunately, this facility closed in 1983. Four important varieties from that station are Theis, Keller, Dale, and M81E. Active sweet sorghum breeding programs are under way in several states. In 2007, the University of Kentucky and the University of Nebraska jointly released a male-sterile hybrid named KNMorris. Dr. Bill Rooney at Texas A&M University has released female inbred lines with higher sugar content for use in the production of sweet sorghum hybrids. Dr. Ismail Dweikat at Nebraska is developing sweet sorghum cultivars with increased cold tolerance. Other lines include chinch bug resistance and non-flowering types. Sweet sorghum diseases are best controlled by rotating fields with non-grass crops such as soybean and by planting disease-resistant sweet sorghum varieties. The same diseases that affect grain sorghum also attack sweet sorghum. Dale is resistant to most diseases. Keller and M81E are resistant to red stalk rot (anthracnose) but are susceptible to maize dwarf virus (MDM). Theis is resistant to both red stalk rot and MDM. Integrated pest management (IPM) practices should be used to control insects in sweet sorghum. This includes “cultural, mechanical, biological or chemical options” (Bradley et al., 2009). Chinch bugs are usually worse in drought conditions, and worms cause the most damage in late-planted sorghum fields. Several herbicides are labeled for grain and forage sorghum. Consult manufacturers to be sure they can be applied on sweet sorghum. In test plots in Missouri, atrazine and metolachor gave good grass and broadleaf weed control. Before planting, sweet sorghum seed was treated with fluxofenin herbicide seed safener to minimize crop injury. Sweet sorghum is an efficient user of nitrogen fertilizer. In Missouri, following soybean the previous year, maximum sweet sorghum biomass yields were achieved in some fields with no nitrogen (Stevens, 2009). When nitrogen response occurred, 60 pounds of N per acre were sufficient. For P and K recommendations, collect soil samples and send them to a soil laboratory. Nutrient crop removal for sweet sorghum is similar to forage sorghum. Unless a harvesting machine is developed to squeeze juice on-the-go and re-deposit stalks and leaves in the field, a significant amount of P and K will be removed in the biomass. Most labs request a forage yield estimate when soil samples are submitted to make crop removal calculations. To design a sustainable production system, apply enough fertilizer to offset crop removal or spread the bagasse and vinasse back on the field. 1Freeman et al., 1986. USDA Agr. Handbook No. 611. Sorghum seed head. Photo: Larry Rana, USDA; Wikimedia Commons. The seed heads on sweet sorghum are located on the top of the stalks. As the plant matures, carbohydrates are translocated from the stalks to the head to make starch in the seeds. To maintain high sugar content in the stems, remove the seed heads “when the seed is in the late milk stage” (Bitzer, 2009). Usually in about 2.5 weeks, sugar content will increase to optimum levels before harvest. Most sorghum syrup farmers remove seed heads using cutters mounted on high clearance spray equipment. This procedure will not be as important when hybrid varieties are grown that are male sterile or do not flower at all. To estimate sugar content in juice, use a refractometer to make Brix (%) measurements. Handheld light refractometers and battery-powered digital refractometers can be purchased. Be sure to purchase a model that automatically compensates for temperature. Brix numbers from 14 to 20% would be considered acceptable levels for harvesting. Obviously, the higher the sugar content in the stalks, the higher the potential ethanol yield. Sugar contents in sweet sorghum tend to be highest in years with low rainfall and sunny days late in the season. One challenge is that, upon harvest, sugars rapidly degrade. The need to immediately squeeze the juice out creates logistical challenges in harvesting and transporting stalks for sugar extraction and conversion. This reduces flexibility and can increase transportation costs. To estimate input costs for sweet sorghum, begin with a crop budget for grain sorghum. Below is a budget by David Reinbott, extension agricultural economist at the University of Missouri. (http://extension.missouri.edu/seregion/Crop_Budgets_PDF&Excell/Grain_Sorghum.pdf). For sweet sorghum, you will probably reduce the nitrogen fertilizer and increase the potassium and phosphorus fertilizer relative to grain sorghum. Drying fuel and electricity can be deleted from the budget. However, sweet sorghum seed and equipment costs will be higher than grain sorghum. Sweet sorghum can be grown in many regions of the United States. Under favorable growing conditions, sorghum can produce high biomass yields with low rates of nitrogen fertilizer. The greatest challenge for large-scale production of sweet sorghum for biofuel is the lack of commercial harvesting equipment. It is hoped that this will change in the near future. Several equipment companies are testing sweet sorghum harvester prototypes. To minimize transportation costs, a small gasification or fermentation processing center should be located near production fields. The author is grateful to Dr. Morris Bitzer, professor emeritus, at the University of Kentucky for providing advice and information for this article. Bradley, K., L. Sweets, W. Bailey, and J. Wrather. 2009. Missouri pest management guide: corn, grain sorghum, soybean, and winter wheat. University of Missouri Extension M171. Freeman, K.C., D.M. Broadhead, N. Zummo, and F.E. Westbrook. 1986. Sweet Sorghum Culture and Syrup Production. U.S. Dept. of Agr. Handbook No. 611, 55 pp. Juerg, B., W. Thompson, W. Rooney, and B. Bean. 2009. Management of biomass and sweet sorghum in the Southwest US. Abstract. 2009 International Annual Meetings. ASA-CSSA-SSSA. 1-5 Nov. Pittsburgh, PA.
Stevens, G., R. Holou, D. Dunn, and A. Wrather. 2009. 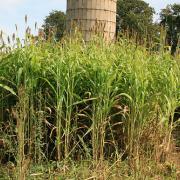 Switchgrass and sweet sorghum fertilization for bioenergy feedstocks. pp. 38-45 Proc. Southern Plant Nutrition Management Conf. 6-7 Oct. Olive Branch, MS.